While interviewing a Sunnybrook surgeon a few months ago, the topic of superstitions came up. He told me that similar to the general public, superstitions are common among medical practitioners. 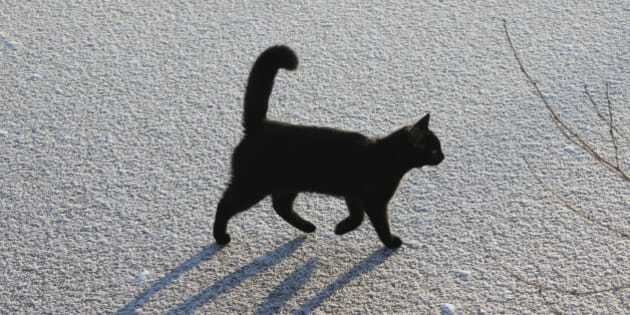 Studies have shown that superstitions are more prevalent in professions and circumstances with higher degrees of uncertainty. Superstitions and professional sports share a long history. Many pros have been known to engage in ongoing, peculiar and ritualistic behaviour to ensure a win, particularly during playoff season. (Think lucky items of clothing and not shaving to name a few.) But in the game of life, many of us can relate to these illogical idiosyncrasies. Why would walking under a ladder bring you bad luck? And how can knocking on wood possibly stave off misfortune? Logically, if asked, most people know there is no cause and effect between any of these behaviours. And yet we continue to throw salt and avoid black cats. Why? Why not. For most of us, these are small little moments that don't interrupt everyday living. They take up little time and effort with possible positive outcomes. All things considered, what's the harm in trying? And if you've done it once with good results, that's fuel for the next time. While interviewing a Sunnybrook surgeon a few months ago, the topic of superstitions came up. He told me that similar to the general public, superstitions are common among medical practitioners. Many surgeons gravitate towards particular music while working, avoid saying certain words during procedures or write things in a patient's chart in a particular order. Just a few examples. Why tempt bad luck? "I have gotten a bit superstitions," says gynecological surgeon Dr. Jamie Kroft, who like many of her colleagues listens to music while operating. "I always start the playlist with the same song, which is "Stuck in a Moment" by U2, for whatever reason. I think a lot of surgeons have certain things they like to do the same way every time. I think it's similar to athletes, right?" Dr. Peggy Richter is Head of the Frederick W. Thompson Anxiety Disorders Centre at Sunnybrook. She is also a leading expert in obsessive compulsive disorder, a condition that causes cycles of repetitive thoughts and behaviours, including compulsive rituals. She says that behaviours associated with superstitions are different and basically harmless as long as people have control over them and they don't take over normal living. "I think most of us would feel really uncomfortable if we were told we couldn't do things the way we've become accustomed to doing them," she says. Studies have shown that superstitions are more prevalent in professions and circumstances with higher degrees of uncertainty. And as Dr. Richter explains it, everyone craves a sense of control in certain circumstances. Doing things in a particular way can often fulfill that need. So keep on closing your umbrella indoors. It will only take a few seconds, and may give you that little something you need (fingers crossed). And of course if you don't believe in any of it, that's OK too. Dr. Shady Ashamalla is a surgical oncologist at Sunnybrook, and says when it comes to rituals and superstitions, it's an area he doesn't wade into. "I don't subscribe to any of it, to be honest with you. I refuse to think I have that much control over anything in the universe." By Monica Matys, Communications Advisor at Sunnybrook.